The EliteSTOR ES4108X12 is a 4U SAS 12G JBOD rackmount with 108 top-load bay for PB in a 1U setup. Utilizing the latest 12G SAS expander technology, the ES4108X12 provides up to 48Gb/s or 4800MB/s of data bandwidth to fulfill the most demanding application. The ES4108X12 supports SATA or SAS 12Gb/s hard drives with new tool-less design that allow easy installation. By utilizing the latest SAS expander technology, the ES4108X12 supports up to 108 SAS or SATA drives in RAID or non-RAID controller card. 12 hot-swappable cooling fans and redundant power supply allow 24/7 operation. Internal cable chain design eliminate cable management arm for easy service. All necessary hardware comes standard including mini-SAS cable, hard drives tray modules and mounting rail. The ES4108X12 is an ideal storage expansion solution for any large storage applications. PBs in 4U - 108 bay in a box. With latest 12TB hard drives, ES4108X12 deliver over 1PB in 4U space. 12Gb/s SAS Expander Technology - Connect 108 SAS or SATA drives to HBA (Host Bus Adapter) or RAID controller. Top-Load, Slide Out Design with Tool-less tray - 108 hard drives are easily accessible by slide out the unit with build-in cable chain design. Hard drives are installed with completely tool-less design for easy installation and service. Superior Performance - Support of SATA 6Gb/s or SAS 12Gb/s hard drives and 48Gb/s of data bandwidth. Support 12G RAID or non-RAID HBA for different applications. Support Industry Standard SGPIO - Serial General Purpose Input / Output (SGPIO) is utilized to provide the hard drives health & enclosure real-time information via the HD mini-SAS connection cable to the HBA (host Bus Adapter) or RAID card without additional serial cable. 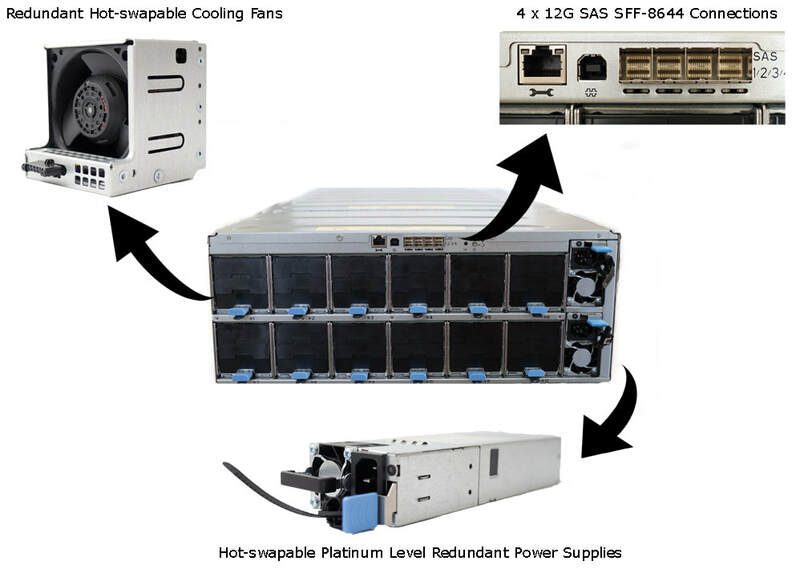 Redundant Power Supply and cooling fans- hot-swappable, redundant power supply and redundant cooling allow 24/7 operation. All hardware are included - HD Mini-SAS cable, cooling fan, tray modules and build-in mounting rail are included. 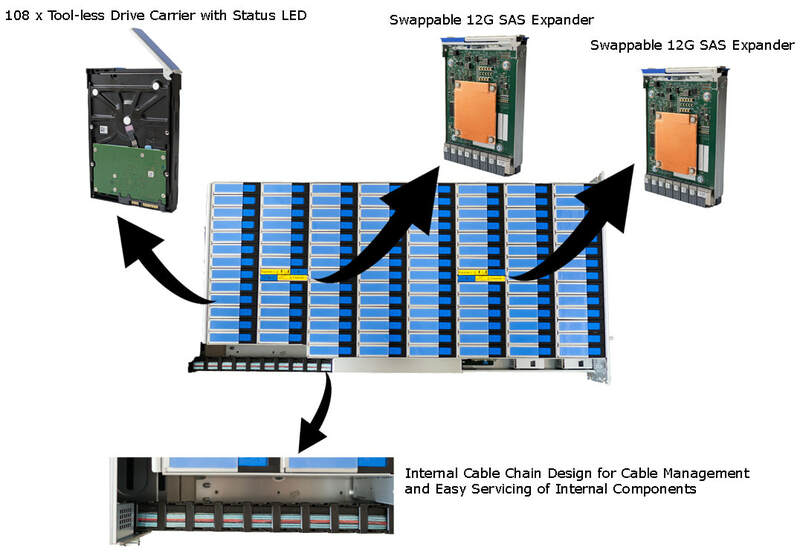 By connecting to a SAS controller and hard drives will instantly increase the storage space. 17.7" x 6.9" x 38.8"